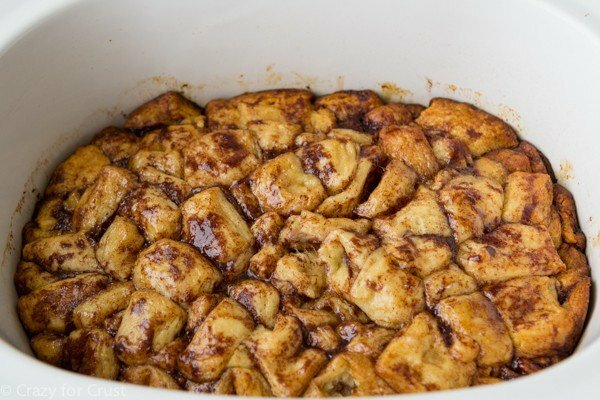 Slow Cooker Cinnamon Roll Monkey Bread is made in the crockpot. 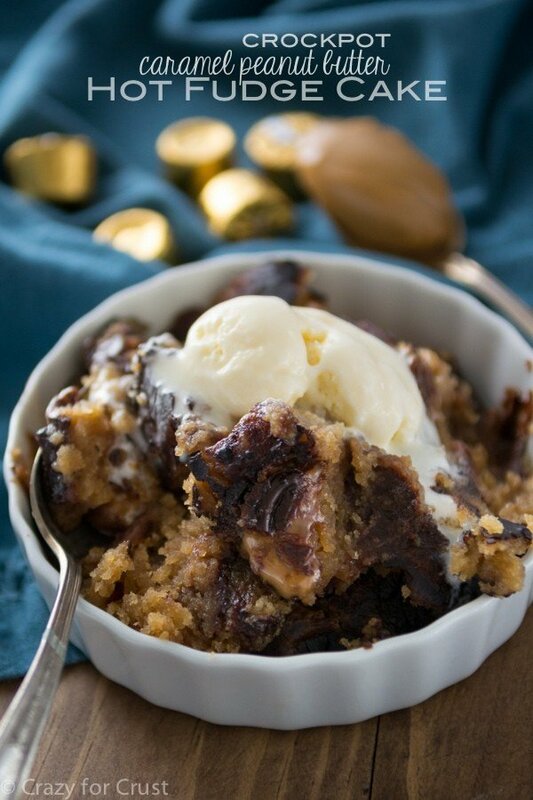 Which makes this an easy recipe that will please many! I have monkey bread on the brain, y’all. 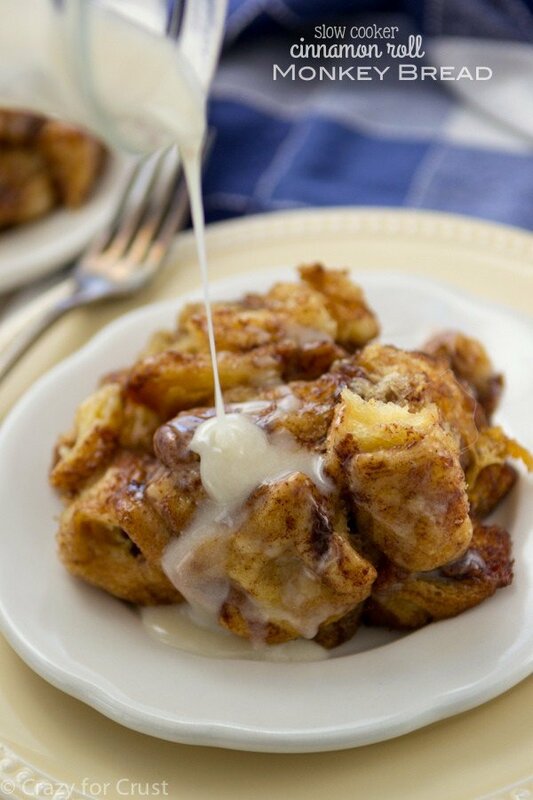 Which is why this recipe comes at the perfect time: Slow Cooker Cinnamon Roll Monkey Bread. That’s a pretty big mouthful of a title…but it’s a pretty good one at that. Until recently I used my slow cooker for one of three things: Salsa Chicken, Pot Roast, or Crockpot Marinara Sauce. Then, over the summer, I learned you could make dump cake in the crockpot. Then, a few weeks ago, I learned you could make actual cake in the slow cooker. All my life I’ve been making dessert in the oven and my slow cooker has sat, mostly dusty, on the garage shelf, only making occasional appearances at dinner. Poor crock pot, so neglected. Not anymore! Last week I bought two cans of Pillsbury Grands! Cinnamon Rolls because (1) I’m addicted to those suckers (and, yes I do work for them but no this is not sponsored, I really do love them) and (2) I was going to make baked french toast with them. And then I got scooped; Heather made Apple Cinnamon French Toast Bake. I almost cried…and then I remembered Monkey Bread. It is almost Christmas, after all. Monkey Bread rules the day on Christmas in our house. I decided…why not make monkey bread? With Cinnamon Rolls? In the SLOW COOKER??? Guess what? 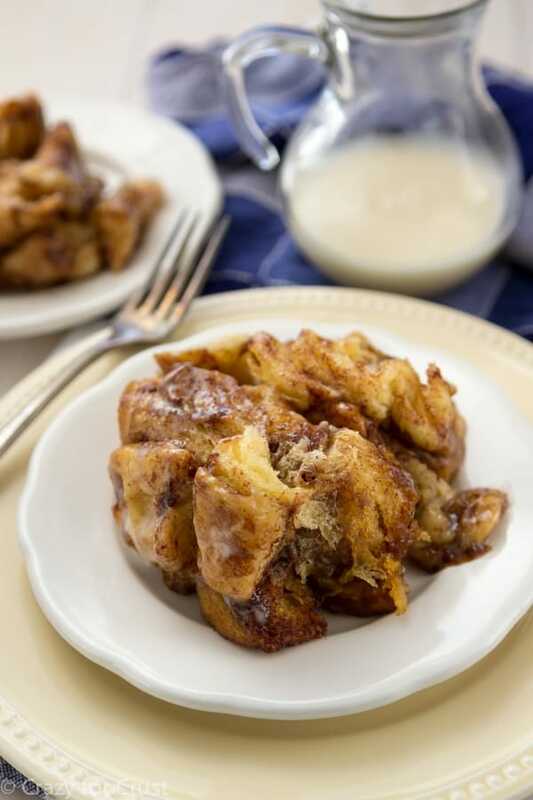 I like thisSlow Cooker Cinnamon Roll Monkey Bread way better than when it’s made in the oven. Way, way better. The reason I love this so much more? Because it’s more doughy. By making this Slow Cooker Cinnamon Roll Monkey Bread in the crockpot, the bread steams as it cooks, keeping it soft and doughy but actually baked all over. It’ll get a little browned around the edges, as you can see, but even the browned parts stay soft. 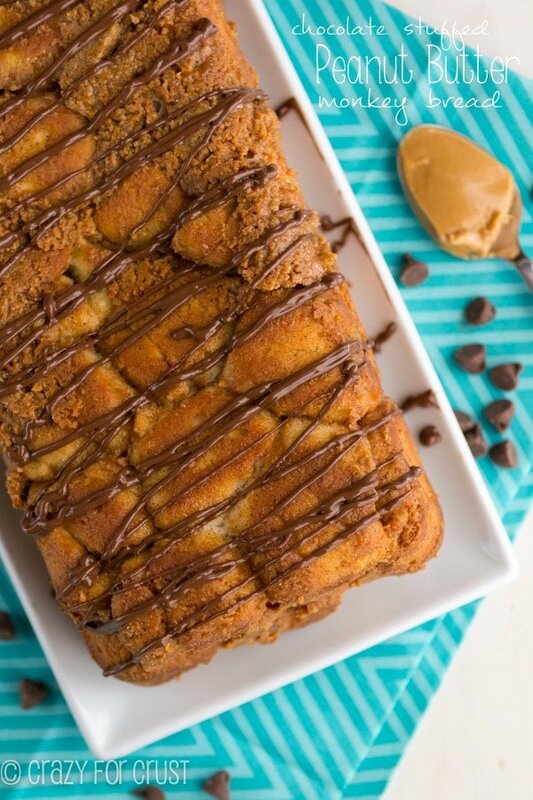 You can make a traditional monkey bread this way, using Grands! biscuits, but I went one step further and used cinnamon rolls because, well, why not? Cinnamon rolls > Biscuits in my opinion. The prep for this recipe is less than 20 minutes. You open your two cans of cinnamon rolls (5 rolls per can) and cut each into 6 pieces. Shake the pieces in cinnamon sugar to coat, then you layer them in the slow cooker with a melted butter and brown sugar mixture. My crockpot baked this in about 2 hours. The edges were browned, the center looked like it might not be done, but upon testing with a toothpick, it was. Note: not all slow cookers are created equal. Mine is a digital model, about 10 years old. I cooked it on the HIGH 4-hour setting and it was done in 2 hours. Because your machine might cook differently, be sure to watch it after an hour, then check again at an hour and a half. This will feed a lot of people, probably 8-10 unless you’re my family, then 4. 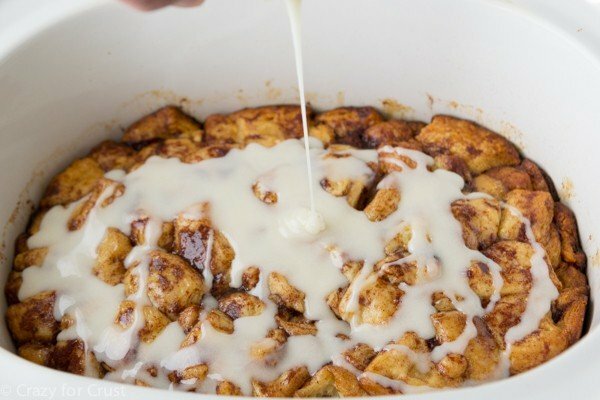 😉 Drizzle the top with the cinnamon roll icing like syrup and you have monkey bread that everyone will remember (and request again and again). Make your favorite Monkey Bread...in a slow cooker! Use Grands! 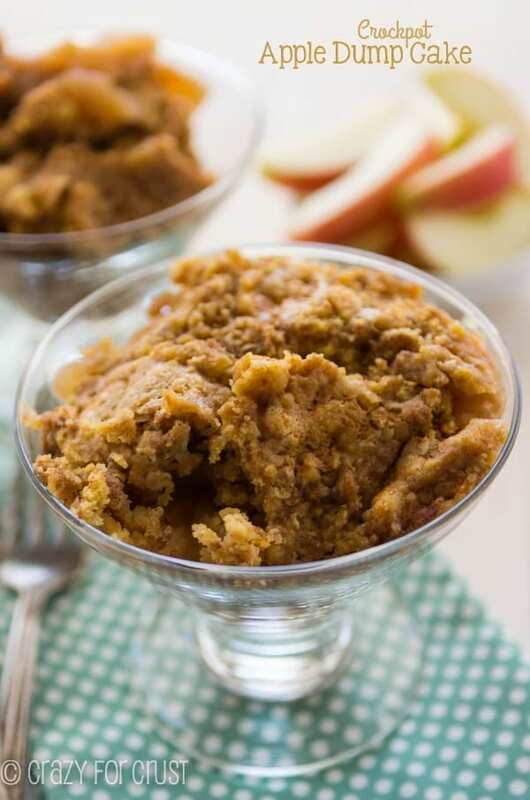 Cinnamon Rolls instead of biscuits for a new twist on an old favorite, then set it in the crockpot and forget it! Note: Not all slow cookers are created equal. Mine has a high 4 hour setting and that is what I cooked mine on. Note: The monkey bread will stick as it cools. Serve from the warm slow cooker and make sure that you take it all out before it cools all the way or it’ll require soaking. I would not recommend the liner. I used one and took it out about 3/4 the way through. I don’t think it got the right heat distribution. also, I did not use the extra sugar and cinnamon. I did use the better and brown sugar. everyone loved it!